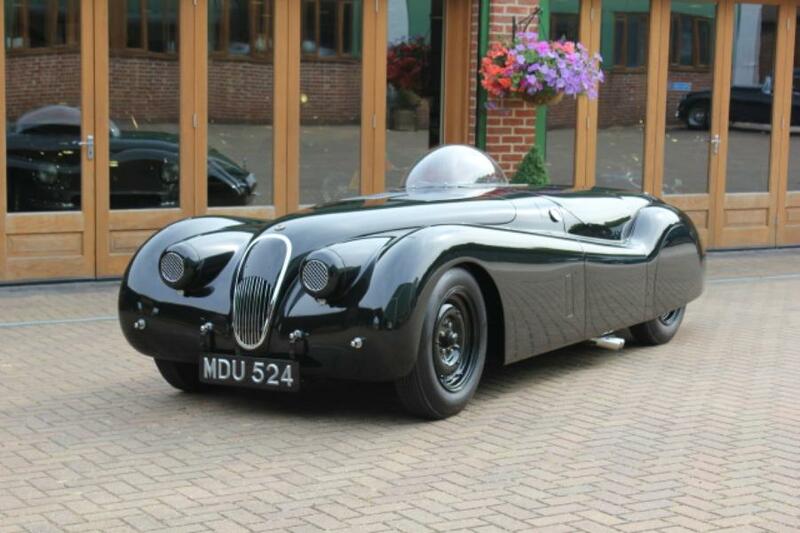 This unusual Jaguar XK120, with its distinctive domed Perspex roof ‘bubble’, is known as the ‘Jabbeke’ XK, famed for its 1953 land speed record of 173.159 mph, achieved on Belgium’s Jabbeke Motorway. Built is 1952, this XK120, registered MDU 524, began life as an original Jaguar Works Competition car and went on to compete in the challenging terrain of the Rallye International des Alpes as its first competitive outing. However, this XK120’s real rite of passage came under the command of Jaguar’s then test and development driver Norman Dewis, who drove the car to a Land Speed World Record of 143 mph on the Jabbeke Highway, Belgium in 1953. By April of that year, ‘MDU’ had lost the title to a V8-engined Pegaso which was timed at just over 150 mph. Eager to reclaim the land speed title, Jaguar set about modifying MDU in order to improve its aerodynamics and streamline the car to improve its maximum speed. The most notable of these changes was the Perspex bubble which would go over Norman’s head during the second attempt. Upon their return to Jabbeke in the latter part of the year, the performance of both the XK120 and Norman fast surpassed any expectations as the car achieved an incredible top speed of 173.159mph and reclaimed the World Record for the Flying Mile with a speed of 172.412mph. Following its 1953 land speed record success, Jaguar sold MDU 524 and it was subsequently used in club racing events, resulting in it losing some of its aerodynamic modifications. ‘MDU’ underwent an extensive 18-month restoration by Essex-based classic car specialists, JD Classics, on behalf of its American owner in 2011. The JD Classics’ team of in-house specialist technicians returned the XK120 to its original land speed record specification, including an accurate reproduction of all the car’s period aerodynamic aids, most notably the Perspex bubble, full-length alloy under trays and forced carburettor air induction system.